Prominent Mexican journalist is sued by a former Mexican state governor for moral damages. Friday, September 2, 2016: Sergio Aguayo, a prominent political commentator, was sued by the former governor of the Mexican state of Coahuila, Humberto Moreira, for moral damages. In a January 20th article in Reforma, Aguayo described Moreira as “a politician that releases the stench of corruption.” This accusation stems from an investigation into the disappearance of 300 residences from the Coahuila town of Allende during Moreira’s governorship. The setting at the Waldorf-Astoria hotel on Tuesday represented the height of refinement, but Alan Rusbridger, editor in chief of The Guardian, reminded the black-tie crowd at the annual dinner for the Committee to Protect Journalists of something it knew all too well: in many parts of the globe, its profession is under murderous assault. “Targeting journalism has become a trend, and now the people who are harassing and killing journalists include governments as well as the people you would expect,” said Mr. Rusbridger, who, along with others, was honored at the gathering in New York. 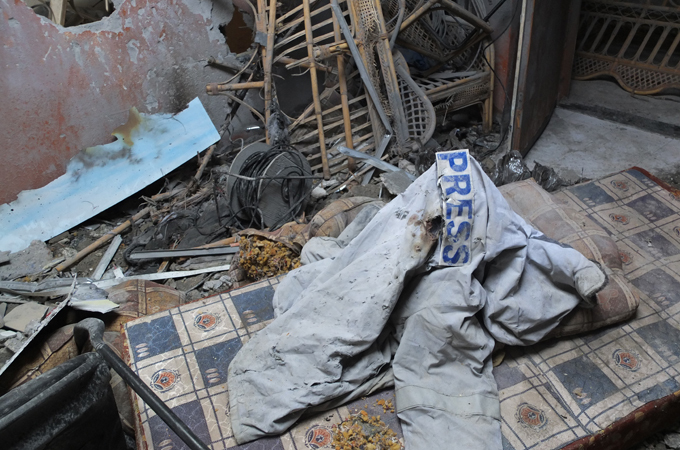 GAZA CITY, Gaza – The targeting of local journalists in Gaza has been seen as the Israeli government’s latest attempt at preventing the broadcasting of what many Palestinians consider to be the achievements of their resistance against Israeli aggression. On Tuesday, Israeli airstrikes killed three Palestinian journalists. Mohammad al-Koumi and Houssam Salam, both cameramen for al-Aqsa television, were hit while traveling in a car clearly marked as belonging to the broadcast media, according to the station. Mohammad Abu Aisha, a journalist with al-Quds Educational Radio, was also killed later that day, when an airstrike hit his car. Why the world still needs war correspondents. The young freelance journalist kidnapped recently in Syria, Austin Tice, joins the long list of reporters who, having taken great risks with their lives and freedom to focus our attention on the travails of distant and very different people, are now paying the price. That list, which includes Mary Colvin, Tim Hetherington, and Daniel Pearl, among many others, had my name on it for seven long years. The Committee to Protect Journalist Mourns the death of four journalist in Peru. New York, November 6, 2012–The Committee to Protect Journalists is saddened by the deaths of four Peruvian journalists who perished Monday in a car accident in the central highlands Junín region while on assignment, according to news reports.